Apple battery benchmarks are always misleading. Phil Schiller talks battery benchmarks. Battery life is a really, really important aspect of smartphone performance. Really. The more reliable the battery, the less frustrating your life. But iPhones tend to have pretty middling battery life, and the 5S in particular didn’t really improve on the iPhone 5—it had a slightly bigger battery but needed more juice to power its souped-up processor. But now the iPhone 6 and 6 Plus boast even bigger batteries, so that means less mid-day charging, right? Probably not. Large display, bigger design, incredible performance, obviously that impacts battery life. Well, I’m really happy because the team has worked hard to make the iPhone 6 and iPhone 6 Plus have equal or better battery life in every metric than the iPhone 5S. At least he knows that we know that a power-sucking screen, faster processor, and secondary processor could easily be a recipe for terrible battery life. But “equal or better” doesn’t sound very encouraging. Apple pretty much always provides a handy benchmark chart to show the battery life it thinks its products get. Unfortunately, the company is either delusional or … trying to sell something, because those numbers are almost always too high. 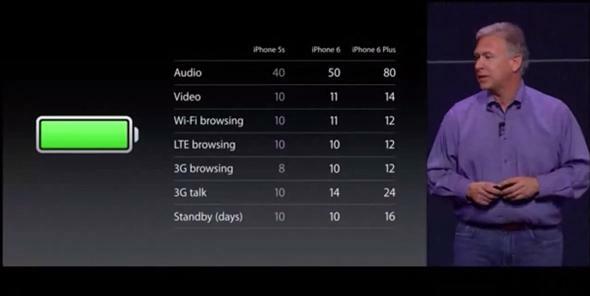 For example, the chart above says that the iPhone 6 will be able to play 11 hours of continuous video while the 5S could play 10 hours. That sounds good! But the 5S definitely couldn’t play 10 hours of continuous video in the first place. Some reviews found that the iPhone 5S battery lasted for a little more than five hours. Others pegged it around eight. Either way it’s less than 10 and requires recharging during your day. That makes me think that Apple’s one-hour increase estimate for the iPhone 6 won’t actually amount to any noticeable improvement for users. Another thing to think about when you look at Apple’s impressive benchmarks is that they don’t really list anything you actually do with your phone. Do you wake up in the morning and play video until your iPhone dies? No. Do you continuously play music for more than two days straight? No. And you don’t talk on the phone all day or browse the Internet continuously, either. Of course the benchmarks are trying to show different extreme parameters to give a feel for how the battery will perform. But since we all use our smartphones for a variety of things throughout the day, not just one, some type of hodgepodge category that at least gave a nod to push notifications, simultaneous downloads, location tracking, and intermittent browsing would be more useful. But probably too honest for a product pitch. There’s a little more hope for the iPhone 6 Plus, since it’s so big and Apple lists it as doing substantially better in many of its benchmark tests (14 hours of 3G talk on the 6 versus 24 hours on the 6 Plus, for example). But who knows! I bought an iPhone 5S last year, was horribly disappointed with the battery life, recently got it replaced under warranty because of an unrelated issue, and continue to be depressed by the battery longevity of the new unit. And nothing so far reassures me that the iPhone 6 or 6 Plus will be better. Given that Apple tries to improve every benchmark with every generation of every product it’s clear that battery life just hasn’t been a top priority for iPhones. And since that’s what keeps the whole thing running, it’s really a shame.